Last season both Tom Anderson and Shay McCartan went on loan. Anderson's stay was short due to a knee injury but McCartan impressed before returning to Turf Moor. Liversedge is the first of the development squad to go out on loan this season. He joined the Clarets from Whitby in the summer and signed a one year deal. He's played in some of the development squad games, alternating much of the time with Danijel Nizic. 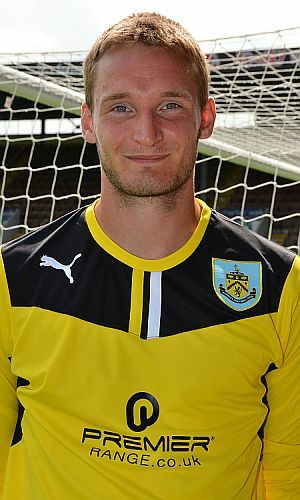 He did make the first team squad on one occasion, in the Capital One Cup tie against Preston when Alex Cisak replaced the suspended Tom Heaton with Liversedge taking the goalkeeper's position on the bench. He joins Hyde with them bottom of the Conference with only two points from their opening nine games. They are currently a point behind Macclesfield and two points behind Aldershot, although the Shots started the season on minus ten points. The two points won came in consecutive 2-2 draws in August, firstly at home to Hereford and a week later at Wrexham. Liversedge will go into their squad for tomorrow's home game against Welling and will also be available for further home games against Braintree and Gateshead and away games against Salisbury, Lincoln, Luton and Dartford.